On the 18th January last year we saw our little baby for the first time – the day when Baby Morgan became even more of a reality. As well as the morning (all day!) sickness to prove it, we now had beautiful pictures of our baby too. 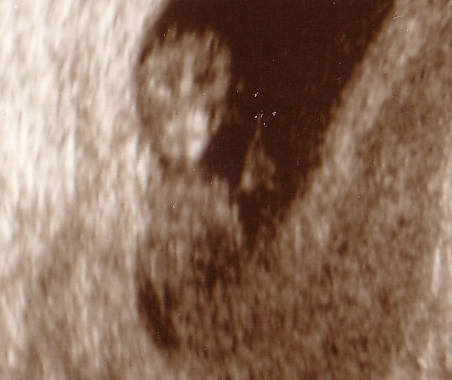 Of course we didn't know she was Anabelle yet, but we could see her little heart beating and was amazed that we could already see arms, legs, body, head and even got a picture of her face. Anabelle: face, body and little hand on the right. We particularly love the picture of her face. Anabelle looked like a chimpanzee! The detail we could see in those first pictures, for a tiny little thing that was only 5cm long at the time, we were in awe. Of course Jon got the brunt of the chimpanzee jokes from friends and that obviously the baby was looking like him! 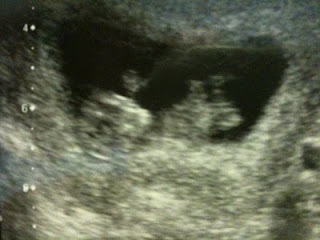 Turns out, Anabelle by 32 weeks looked nothing like a chimpanzee but did look everything like her Daddy. We left the scan over the moon, dated at 11+2 weeks and given a due date of 7th August 2010; a week after our first wedding anniversary. Perfect. We framed her scan pictures and put her up in our living room. Our baby! Those precious first pictures are still on display today, a year ago today those pictures were taken. Today, all we have is pictures and a box of memories.